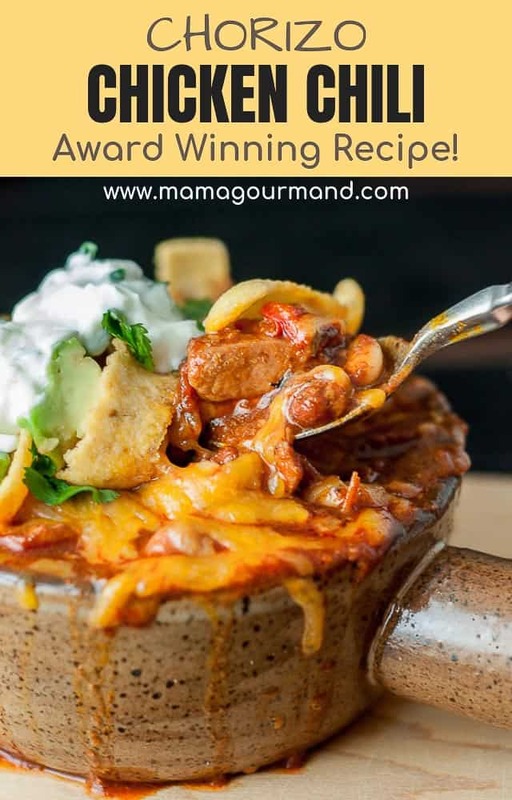 Chorizo Chicken Chili | Award Winning Recipe! Chorizo Chicken Chili makes one of the best chicken chili recipes with tender chunks of chicken, a chorizo red sauce, beans and secret ingredient spices. 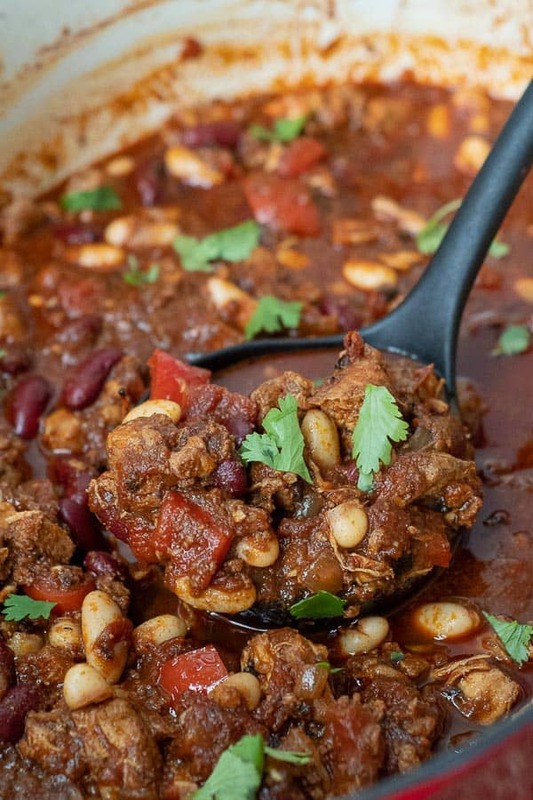 This red chicken chili recipe is so amazing, it is guaranteed to win chili cook-off contests! Scroll down to read more tips on how to win a chili cook-off! 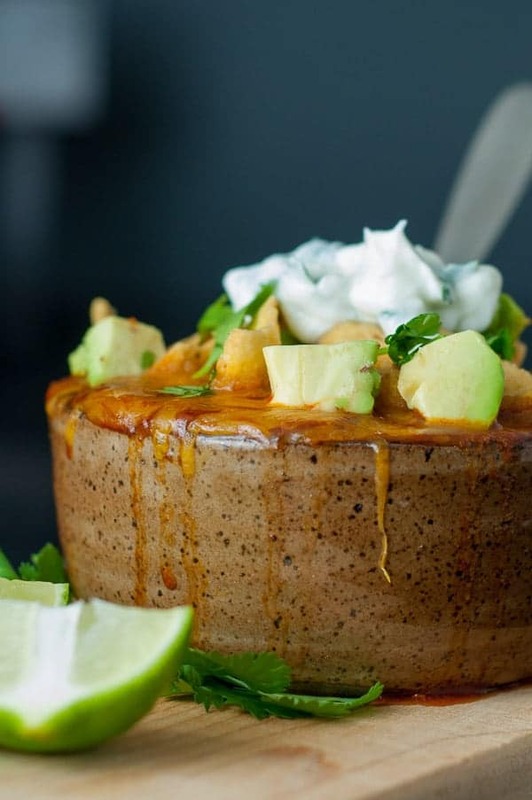 Chili cook-off and football season is upon us, so I thought I’d give Chorizo Chicken Chili with Lime Cilantro Sour Cream a second showing on the blog. Chorizo Chicken Chili was the winning contender in a neighborhood chili cook-off. May not sound like much to boast about, but competition was fierce. 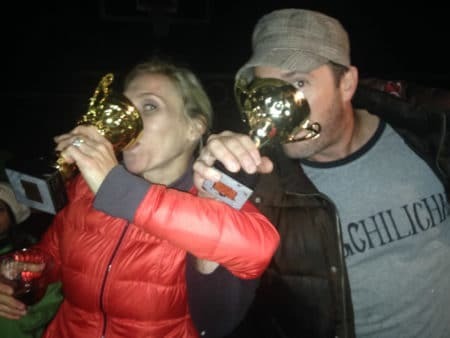 Among the entrants was my good friend, seen below, who thought if he showed up with his ChiliChamp T-shirt and drank beers from his previous year’s trophy, he’d secure the hardware again. Obviously there were no hard feelings when I clenched the title, and we passed the symbolic Chili Torch with a toast. So anyway, the point of this post isn’t just to toot my own horn (insert tiny toot), but to finally admit just how much forethought went into making my chili. I may or may not have gotten some carpnal tunnel researching spices, techniques, flavor profiles, and ingredients online. 1. Put some Flavor in your Flave. Add a little something unexpected to elevate the taste, but not overwhelm it. 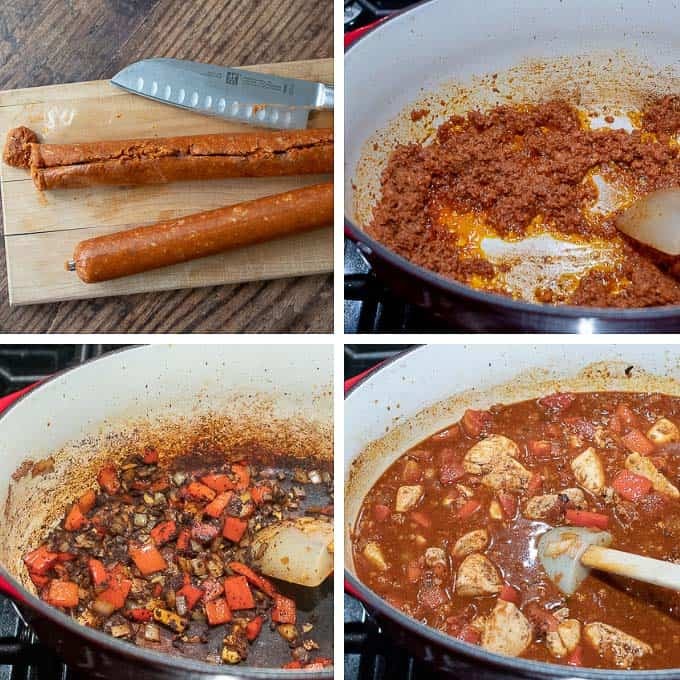 Two staple ingredients I usually add are unsweetened cocoa powder and brown sugar, which are used in red Chorizo Chicken Chili. Some other good additives are strong coffee, chipotles in adobo, beer, red wine, cinnamon, sweet potatoes, butternut squash, canned pumpkin, smoked paprika, balsamic vinegar, ancho chili powder, nutmeg, peanut butter, or coriander. Sautéing spices with a little fat is essential for releasing more flavor. After the meat sears and veggies cooked, add the spices to cook for a minute before adding the liquid. This is a good tid bit for lots of dishes, not just chili. 3. If you can’t take the heat, don’t tickle the dragon. You have to go big, or at least bigger, on the spice if you want to secure a win. Heat is expected in chili, and if it is altogether missing you just spent a lot of time simmering a complex pot of soup. Tying into tip #1, use something unconventional for the heat, not just cayenne pepper. Some good choices are ancho chili powder, freshly ground dried chiles, chipotles in adobo, sriracha. In Chorizo Chicken Chili I use chorizo as a source of spice. If you want to stick with ground beef, more power to you, but add a little pizzaz to go along with it, such as chorizo, breakfast sausage, or Italian sausage. Generally I use a combination of two proteins, which could also be bacon, steak, brisket, short ribs, ground pork, or chicken thighs. 5. Patience. Learn, you must. Chili is not something you can rush because it needs a long time to simmer and meld the flavors. I’m sure you’ve heard low and slow a thousand times, but there is a very important step a lot of great chili recipes fail to mention…make it the day before! I’m a big fan of doing this not only for the chili’s advantage, but for my own. I don’t have to sweat over a vat of chili all day long when I plan on entertaining. This is a great secret weapon, but use it wisely. 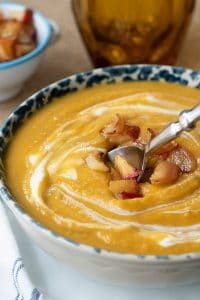 Don’t add anything that is going to soak up the liquid or develop a off-putting texture the next day, such as beans or sweet potatoes. Add those while warming it up the next day, which is also a good time to make any other spice adjustments. 6. Throw out those jazz hands. You’ve put a lot of time and effort into this dish, now make sure you give it some flare. Put some thought into the chili toppings. 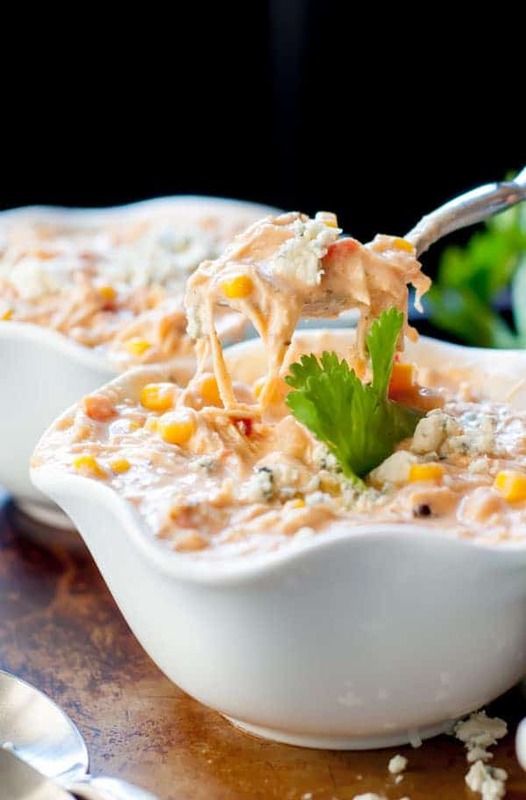 A sharp cheddar, monterey jack, queso fresco, or pepper jack are some great cheese choices. Adding something fresh and light to offset the spiciness, such as fresh cilantro, scallions, avocado, or some freshly squeezed lime, is also a well-played added punch. The Lime Cilantro Sour Cream I use for this recipe and my Sweet and Spicy Tacos, is really worth the five extra minutes of effort, trust me. Of course, don’t forget those Fritos or crushed tortilla chips. Remove the casings from the chorizo by cutting a slit across the top lengthwise. Sauté the uncased chorizo until cooked through. Remove the chorizo from the pan and set aside. Cook the chopped veggies in the chorizo drippings. Add the spices and cook a minute longer. Add the chicken, tomatoes, broth, and cooked chorizo to the pot. Simmer uncovered until chicken is very tender. Add the beans and adjust spices, if necessary. SAVE THIS CHORIZO CHICKEN CHILI TO YOUR PINTEREST BOARD! Mix the chili powder, cumin, unsweetened cocoa, and brown sugar together in a small bowl; set aside. Heat olive oil in a Dutch oven or a large pot over medium-high heat; cook and stir chorizo, breaking up with spoon, about 4 minutes. Remove chorizo to a bowl. Season chicken with salt and pepper and add to the oil and drippings to brown on all sides, about 5 minutes. It does not have to be cooked through because it will simmer and cook through later. Remove and add to the bowl with the chorizo. Add a splash more olive oil then sauté onions and peppers in the pot for a 4 minutes, until they begin to soften. Add the chopped garlic and saute for a 30 seconds more. Add the mixed spices to the onion, pepper, garlic mixture and sauté for and additional 30 seconds. Add 1 cup of the chicken broth, scraping bottom of pan to loosen bits and pieces. Then add the rest of chicken broth, fire roasted tomatoes, chorizo, and chicken to the pot. Bring to a boil. Reduce heat and simmer uncovered for 1 1/2 - 2 hours, or until chicken is tender and falls part easily. Add the beans, 1/2 teaspoon salt, and 1/2 can of tomato paste (if necessary to thicken) to the pot. You can adjust the amount of tomato paste depending on whether you like your chili thicker or thinner. Season with salt or a little cayenne pepper if you like it spicier. Mix together all the ingredients. Add salt to taste. Serve chili with desired toppings. *Chicken thighs gives more flavor, but 1 1/2 pounds of chicken breasts can also be substituted. 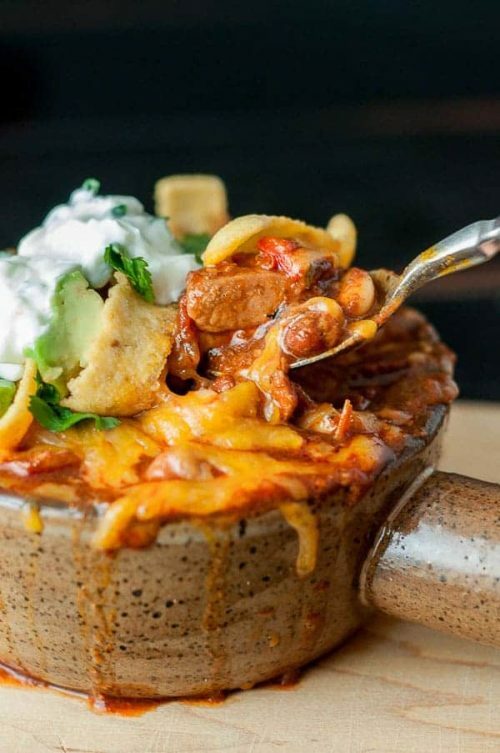 Making this in the insta pot for a work national chili day cook-off! Sorry for the VERY late reply, but somehow this got sent to my junk box. Thank you so much for posting the instant directions. I’m going to give it a try like this. How did it turn out? This has become a favorite in our house since I started making it some time ago. Thanks for the recipe! This is my absolute favorite chili. We found it on the morning of a chili cook off and decided to try it. We won first place and I haden’t even tasted it yet. Now we make it at least every few months. Thank you! I just made this exactly as written and it was delicious. My husband is very picky when it comes to chili and he raves about it. Thank you for sharing your recipe! That is so great. I’m so happy it passed the husband test 😉 Thanks for taking the time to let me know, Amy. Can you use boneless skinless chicken breasts as opposed to thighs? If so would the amount change? Hi Cindy, You can most definitely swap out chicken breasts. I would probably use 1 1/2 pounds. Thanks for writing and enjoy! I’m making this via crockpot right now. I couldn’t find this recipe but I remembered seeing it before and the chicken chorizo combo sounded awesome. I had to wing it. I used pico de gallo, black beans , and corn. Well see this afternoon how it turns out! Hello! Those additions sound amazing. Let me know how it turns out! We had a chili cook off at work today which I host every year. I make a chili but go for super easy with canned ingredients wherever possible. Lol it’s super serious though and some folks even grow their own ingredients so I never expect to win wth my canned chili beans but the chicken chorizo was a big hit this year. I didn’t win but I think something is lost in the presentation because we don’t allow toppings and extras so I didn’t get to make mine pretty like yours and the chorizo looks pretty greasy. It was great at home though with the sour cream! I’m glad everyone liked it (even if you didn’t win 😩) It does taste so good with the lime sour cream on top. You’ve inspired me to make this chili this weekend with all this talk about it. I love this recipe! What chorizo brand did you use? Pork or beef? Cant wait to try it!! I usually use pork, but I’m sure either would be fine. Enjoy! Would it be ok to add one bottle of beer to this recipe? Sure it would! I would reduce the chicken broth by half, though, so it isn’t too liquidy. Wow Rebekah! How great to hear! I’m so glad you took the time to let me know because that makes me very happy. Thanks for sharing! what adjustments would you make if you were cooking this using a slow cooker? Hey Ashley, I would brown the chorizo and chicken and throw that in the crockpot with all the rest of the ingredients EXCEPT the beans and tomato paste. You can add those at the end when the chicken is tender, maybe 6 hours on low? The chili might have a little more liquid because of the slow cooker, so you’ll have to probably add more tomato paste or leave the lid off the last 30 minutes or so before adding the paste. Let me know if you try it and how it turns out… I have been wanting to try it in the slow cooker too. Awesome and different chili. I am always looking for something beyond the standard ground beef chili and this one fits the bill! Loved the chili cook-off hints – will put them to use with all my chili endeavors! Hey Shelly, This is definitely not your typical chili. Glad you liked all the cook-off pointers. Hope they come in handy with bringing home some hardware!